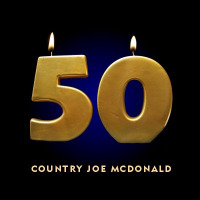 Unlike so many a romanticized recognition of the past in this year that marks half a decade since the so-called 'Summer of Love," Country Joe McDonald's 50 is a celebration of the passage of time. And this is a crucial distinction the former leader of The Fish articulates on this album in all manner of ways. This baker's dozen tracks opens in somewhat startling fashion, a spare acoustic guitar finger-picked above which McDonald's voice, equally drenched in echo, reedily recalls the pathos Neil Young could conjure in his early days. A rumination made all the more haunting because it's just over three minutes and a half long, this track trailing off in the distance via odd tones struck as if to beckon the listener into a world of time and space another than the one we normally inhabit. And although it may go on a bit long at the nine-minute mark in providing a return path, the collaboration between McDonald and musicologist/soundscapist Bernie Krause,"Seashore Symphony #2," serves much the same purpose as the the penultimate cut. Bottleneck courtesy James DePrato plus percussion from Prairie Prince during "I Don't Think So" sharpen the focus from the soft notes of Joe's harmonica as it wafts into earshot; the beauty to behold here is that, again, the economy of the cut leaves its impression, then ends without overstatement of what's implied in the song's title. The skeletal likes of the lyrics there read almost like a haiku, but even more pointedly so on "I'm Free" and "Where Did the Time Go," the latter of which is less forlorn than celebratory, not to mention evincing an almost defiant air. The simplicity of the arrangements on 50 are delicious even if the subjects of some of the songs, like "Sadness and Pain," are not. Still, the intimacy of the sound, as produced by McDonald and Michael Rosen (who engineered and mix the album), softens the stark impact, even when Joe's singing teems with agitation as it does on "Black Fish." And when on "Silent Rage," the playing erupts into much higher volume and intensity, the snarling electric guitars and walloping drums all sound appropriate, on their own terms as well as the inevitable end result of the indiscernible momentum generated from the preceding tracks. Streamlined and upbeat in its own way, "Daughter of England" suggests Country Joe McDonald could stylishly present an acoustic/electric performance on any concert stage, where the topical likes of "Era of Guns" would nevertheless be subsumed in the sound of the music and its core emotion(s). Hardly a relic of a time gone by, the man whose name adorns 50 is alive and well, not to mention vigorous in his discerning eye and lucid method(s) of expression. One of the best albums of 2017 so far, it is very much of its time, but will likely never turn dated. Track Listing: Round and Round; I Don't Think So; Poppa and Momma; Sadness and Pain; Black Fish; Silent Rage; Daughter of England; Compared to Florence; Era of Guns; I'm Free; Where Did the Time Go; Seashore Symphony #2; Roseeann.